LG Phone Suite is the best latest setup installation file desktop application for LG phone users who want to manage their devices easily and safely. This is the latest management tool for data synchronization, practicality, and usefulness. The interface is also very attractive and modern looking. Upon the installation and first-time use, the USB drivers are also installed with the main application and a splash screen is shown. It can be disabled on application opening. On the upper part we have the main synchronization functionalities and when clicking one, a new tab is opened with details. On the Home section, Phone details are shown and users have the possibility to connect their phone by using the Connect phone button. 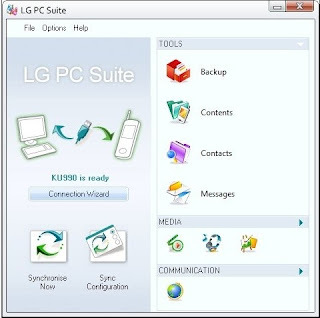 Below, The LG Suite version is shown and also, if there are any updates to that specific version, they can be installed on the PC when the button is pushed. Sync contains the synchronization options and allows the user to choose what to synchronize between the PC and the mobile phone. Also, there is an option for automatic syncing when the phone is connected. Transfer contains all the types of files and users can pick between them (Photos, Videos, Music, and Messages). Transfer settings allow a custom folder to be set up when transferring the files between the devices and Transfer history shows what has been transferred so far. Settings handle all the details functionalities of the application and Phone Backup and restore opens up the relevant wizard for either backup and restore process. contacts handle the phonebook on the mobile phone. You can show either all the contacts at once by clicking on All or select a certain letter to open the contacts beginning with that letter and search for a specific contact. With the Settings option, You can change contacts related setup. The calendar shows all the meetings planned by you. Different views are available (daily, weekly, monthly) and new schedules can be added on the fly. Messages show all the SMS's present on the phone. New message creates a new SMS to send to a specific mobile phone number. Photos handle the images on the device. Drag and drop is supported so pictures can be transferred between the device and the PC on the fly. Click on the Open folder to choose a custom folder on your desktop computer. Add folder creates a new location on the LG device. Videos have pretty much the same options as the Photos option (Open the folder for the PC and Add the folder for the phone). Drag and Drop is also supported here. The music contains the Import feature, Search feature and a player for the music files. Playlists can be created containing certain music genres. The timeline shows all the operations that have been made on specific file types (videos, images, events, messages, calls). Simple and at the point, this application synchronizes and transfers data between the PC and device and also manages additional settings on the file types.You can easily download LG PC Suite by just clicking the link belw and enjoy.